Artist Richard Armendariz creates larger than life kid's fort for families to explore. Photo courtesy: The DoSeum. (April 11, 2017) -- He's proving that building forts out of blankets isn't just child's play. 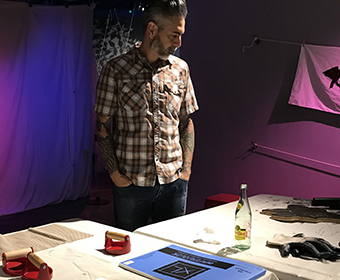 Richard Armendariz local artist and associate professor of studio arts at The University of Texas at San Antonio has built an interactive fort for families to enjoy as the first artist-in-residence at The DoSeum in San Antonio. DoSeum staff chose Armendariz' project proposal to create an oversized childhood bedroom fort out of large sheets. Armendariz said the fort is ordinary on the outside and magical on the inside, where he printed the sheets to resemble a forest. He created an original animation using animals, mythology and life lessons for families to explore in the exhibition. "This exhibit features themes from my past work on indigenous cultures and the tradition of story telling. I would like children to walk away with a clear understanding of their unique skills and abilities," said Armendariz. Armendariz wants this to be both a cultural and educational experience for children and their families. "I hope people, young and old, walk away from my exhibit feeling like they learned something about art and themselves," said Armendariz. Armendariz' exhibition, The Dream Keeper, runs through April 30. Throughout the month, he will be on-site for interactive workshops. Armendariz works in the UTSA Department of Art and Art History and his research areas include painting and drawing. The Department of Art and Art History offers professional training in the visual arts and art history to undergraduate and graduate students. Learn more about Richard Armendariz. Learn more about theUTSA Department of Art and Art History. Learn more about the DoSeum exhibit.